I finally got my act together Tuesday and started soaking our shiitake mushroom logs. I suspect that I could have done this earlier in the year, but during our blueberry patch clearing operation, a tree fell on the logs and I hadn't gotten around to excavating them. The logs we're soaking are two years old. We inoculated them in spring 2007 and ignored them all that year. Then, in 2008, we started soaking them and harvesting mushrooms. 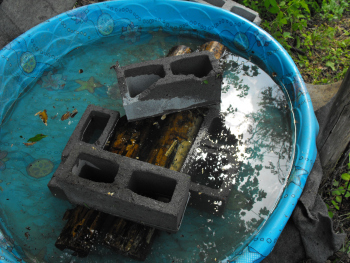 Each week during warm weather, I soak two or three logs for 24 hours, which prompts them to produce mushrooms. If everything goes as planned, we'll be eating mushrooms next week!